BKOOL is more than just an indoor cycle trainer, it is a complete package that includes the trainer itself but also a web based community. The whole system is developed to allow you to test yourself or interact with others as you used the BKOOL kit. Be aware however that to access all of the features you will need their Gold Subscription membership, although basic features are covered in their free Bronze Subscription. 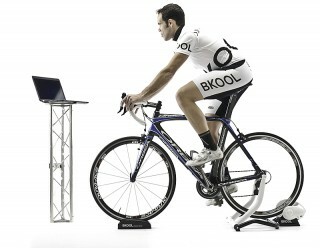 Out of the box you get the BKOOL trainer, which uses an electro-magnetic resistance brake, a cadence sensor, a front wheel support, and an ANT+ USB for you computer or laptop. You can download the free BSim software from the BKOOL website and set up a profile and then you can start your workout. 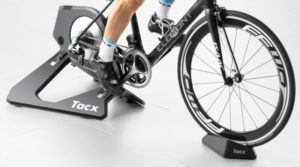 The resistance of the trainer is automatically and wirelessly controlled via the software, and if you have access to the training videos your resistance will be synced to the terrain you are riding. The maximum incline simulated is 20%. The way in which the back wheel of your bike fits against the resistance roller is slightly different, and in the opinion of most, better than other comparable trainers. Instead of pushing the resistance roller up against your wheel and locking it in position (which could mean you over or under tighten the roller), your actual weight pushes down onto the resistance roller providing a more realistic road-like feel. In addition to the actual training, BKOOL have packaged together a social environment where you can communicate, challenge, and compare against other BKOOL riders. This is a great way to keep motivation up and track your progress as you do more and more sessions. 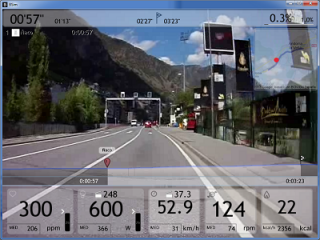 Also, the indoor cycle trainer is compatible with the BKOOL app, which allows you to record and upload your real life rides via GPS so that you can recreate them on your turbo trainer. Using Google maps you can track your progress, and even use other BKOOL member’s courses. There are an array of analysis options to really keep you motivated and allow you to track your performance, such as power output, heart rate, and cadence. You can even see the stats of other BKOOL competitors you are racing against via the on-screen readouts. 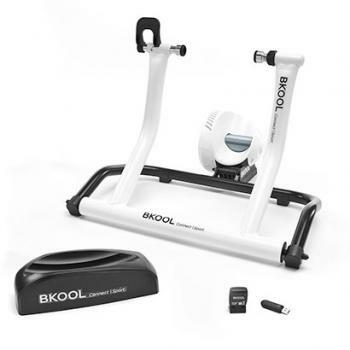 BKOOL really is a complete package, and while not cheap you do get a high quality turbo trainer with a huge amount added benefits. One thing to remember is that a lot of the online features are hidden behind additional subscriptions, although these work out at as little as £7/month, which for what you get is very reasonable. The subscription includes a huge database of video circuits to ride, the social network of competitors and races, and other analytical displays.